Encountering iPhone stuck at Apple logo issue is quite disturbing. Worst of it all, discovering it in your latest iPhone XS Max/XS/XR can upset you even much. Stuck issues can incur in any phase of your iPhone, so you must know how to tackle this unwelcoming situation. And thankfully, you have landed in the correct place, as you will unveil 5 ways for restoring iPhone stuck with the Apple logo issue in this article. Once in the blue moon, your iPhone does encounter stuck issue. And, in order to pull it back to its normal state, one of the primary ways is by forcing a restart asap! Restarting your phone can switch the device back to its normal state. So, let's get started and understand how to unbuckle iPhone stuck with Apple logo issue in just two simple steps. The ultimate way of mending iPhone stuck on Apple logo issue is by Any iOS System Repair , a perfect tool designed to repair an array of iOS related issues. From frozen screen to black screen to Apple stuck issue, Any iOS System Repair's 'Repair Operating System' feature handles it effortlessly. Moreover, you can swiftly operate in the latest iPhone XR/XS/XS Max! 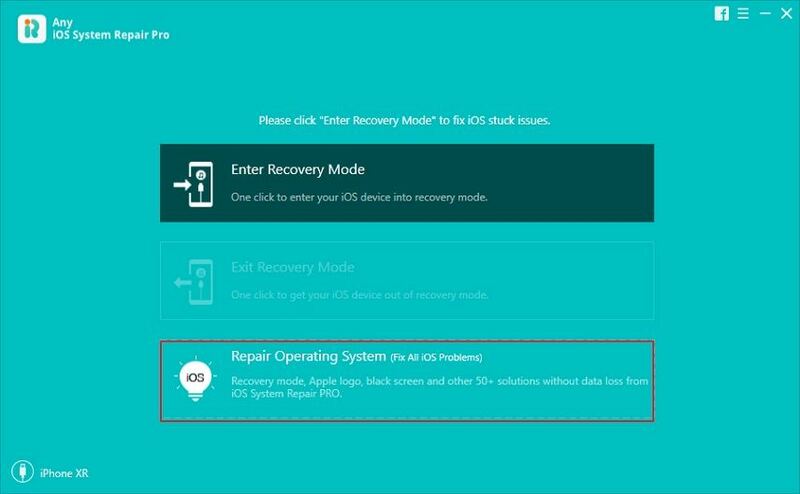 Curious to know how Any iOS System Repair (ReiBoot) work, then the following guide will acquaint you well! In order to unroll Apple stuck issue, download Tenorshare's Any iOS System Repair software on your desktop. Patiently wait for the program to load and detect your device, then opt for 'Repair Operating System'. Now, the following screen will redirect you to an interface displaying 'Start Repair' tab on the bottom. Simply, press it. You will be redirected to an interface for firmware download package, click on 'browse' and set the respective save path. Then, hit 'Download' to allow the firmware to download for fixing the iPhone 6/7 stuck on Apple logo issue. Once the firmware successfully downloads, just click on 'Start Repair' tab for mending whatever iOS issue your iPhone is facing. Notably, iTunes media player is an in-built feature rendered by Apple in their respective models. Not only can you tune into your favorite song or playlist, you can even restore your iPhone using iTunes. Just follow the steps below to pull your iPhone stuck issue on Apple logo. Step 1: In order to begin with, load iTunes on your PC and ensure that your computer is pre-synced with iTunes. Now, carefully use a lightening cable to link your iPhone with PC. Step 2: After connection establishes, tap on device icon followed by selecting 'Summary'. Then, press the 'Restore iPhone' button to get rid of the iPhone stuck on Apple logo screen. You can resort to putting your device on a DFU mode for brushing away the iPhone stuck on apple logo. Depending upon your iPhone model, make use of the following method. Link your iPhone to PC and launch iTunes. Firmly hold 'Volume up', 'Volume Down' key and 'Power' key until the screen goes black. After that, hold 'Volume Down' key and 'Power' key for nearly 5 seconds> release 'Power' key not the 'Volume Down' key. Then, press the 'Power' and 'Volume Down' key nearly for 8 seconds. Now, let go of 'Power' key but continue to hold the 'Volume Down' key. If your screen turns black, it will be indicative of detecting iTunes. Hold down the 'Home' and 'Power' key for about 8-10 seconds. Release hold of 'Power' key but continue hold 'Home' key. Last step – Once iTunes detects your device, simply tap on 'OK' > 'Restore' and confirm the actions. Note: Note: However, it must be borne to mind the DFU Mode may result in erasing data. So, keep a backup of the data beforehand. For a free backup service, Any iOS Data Manager can assist you. And to tackle iOS issues, Any iOS System Repair is the right software! Last but definitely least, one must seek Apple's assistance to get thorough support for any type of iOS related query cleared. The Apple support duly stretches support for its customers and caters your needs accordingly. So, if after following the above methods, still your iPhone stuck at Apple logo, you need to rush to the nearest Apple Store. In a brief summary, you can make use of the 5 methods useful in restoring iPhone stuck with Apple logo problem. But, the ultimate tool of mending an array of iOS issues via Any iOS System Repair, the reliable software that fixes a wide range of iOS related issues (stuck, frozen, black) screen. Let us know which method you found useful!